Two weekends ago, Tiger Woods and Phil Mickelson finally made golf fun to watch again. 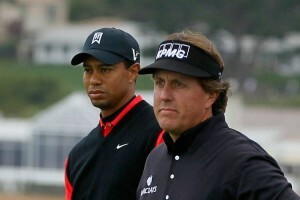 The average person can’t even name 3 of the top 5 finishers but they can tell you that Phil Mickelson beat Tiger Woods. It’s like a LeBron fast-break dunk or Albert Pujols clobbering 3 home runs in a World Series game. We simply love to see the best athletes at the world play at their best. Golf without Tiger and Phil atop the leaderboard is like a dunk contest when Demar Derozan wins. Serious golf enthusiasts who enjoy Dustin Johnson are in the serious minority and I pity them. No? You honestly believe that nothing beats a weekend of stellar play by Lucas Glover and Padraig Harrington? Tiger Woods ended Saturday with a 67 (-5), moving up to third on the leaderboard and 4 behind the leader. And then began the discussion posts of whether the king is on his way back to the throne. Phil Mickelson shot a 70, putting him tied for fourth. 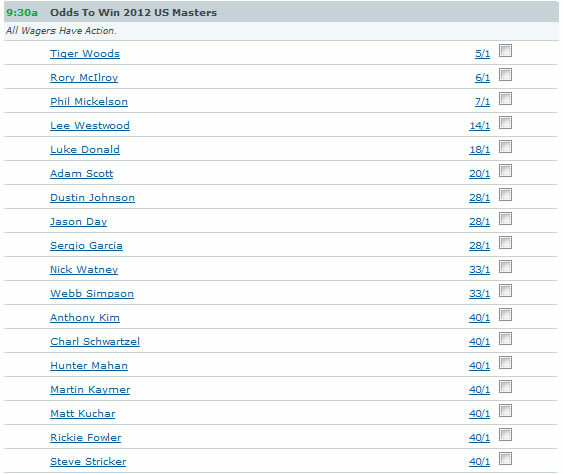 Yet Tiger is still the favorite for the Masters? Vegas odds to win the Masters currently have Tiger highest at 5/1 and Phil third at 7/1, behind only Rory McIlroy at 6/1. Here’s to hoping Tiger doesn’t do the most LeBron thing he can do in April. Because there’s almost no chance he won’t paired with the lefty at some point in the tournament.